In Final Sound Speller, students choose the missing final sound that correctly spells each word. In phonics, students study the relationship between letters (graphemes) and their sounds (phonemes). Students begin to learn phonetic patterns which can be used to decode words during reading or encode words during writing. After mastering the alphabet, kindergarten and first grade students are exposed to basic phonetic rules and patterns, like short vowel sounds and word families. Throughout elementary school, students learn increasingly difficult phonetic patterns. The goal is for students to have solid phonetic skills well before they leave elementary school. It can also be assigned as homework. When explicitly introducing and teaching a phonics pattern, teachers can use Final Sound Speller as a whole group lesson. Teachers can create word lists that help students practice final sounds such as CVC (consonant-vowel-consonant) patterns. These words can support the skills being taught in small group lessons. Many of these lists can be found in Teaching Resources under English/Language Arts. The word is read aloud, but the final letter(s) will not be displayed. 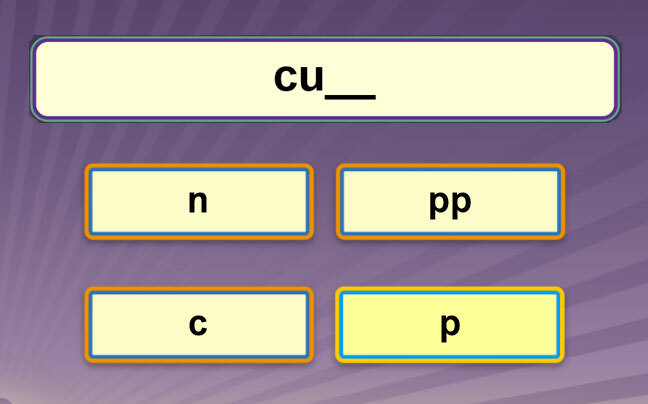 Students roll over the four choices to hear the sound each makes before picking the correct letter/sound combination. A Sentence button is available so students can hear the word in context. A Word button is available so students can hear the word read aloud again. If students answer incorrectly, they will receive immediate feedback. Teaching Tip: Final Sound Speller is perfect to review weekly phonics patterns. The audio features are great for English Language Learners (ELLs).